It is currently the morning of the second day of 16 games of March Madness. I will be updating this post throughout the day, like I did yesterday, but today I will timestamp when I make each edit, so it will be slightly easier to follow. Everything is in Eastern United States time. My NCAA bracket is not looking to good as of yesterday. I am tied for 9/16th place, and I only have 1680 points possible remaining, while other people have up to 1760 points possible remaining. There will be a few big games today that the bracket pool is split on. These are Syracuse vs Dayton and Saint Joe’s vs Cincinnati. The big game for me is Hawaii vs Cal. I have Hawaii pulling off the 13-4 upset, with only 3 brackets calling for that. If this game goes my way, it will be huge for my standings in the pool. Cal is also out their leading scorer with a broken hand, so this game is really a toss up right now. NCAA March Madness Day 2 Games Starting! Syracuse vs Dayton has just started. This game is pretty split in the bracket pool. It is split down the middle, with 8 pick both teams. I picked Syracuse, because they are one of my favorite teams. They have not play that well this year, but they made it to the tournament, and I think and hope they will be able to pull of at least one win, for my bracket and for my team. I am currently sitting on a 100% bracket through the first 4 games on the second day of the round of 64. Syracuse (10 seed) beat Dayton (7), Villanova (2) beat UNC Asheville (15), VCU (10) beat Oregon St (7), and Hawaii (13) beat Cal (4). One of these games was an obvious pick (Nova), but the rest went both ways. In the bracket pool, Syracuse and VCU were both picked by exactly half the brackets, and I am currently sitting tied for 4th place, with 150 points (out of 190). Todays first 4 games make me feel a little bit better about yesterdays picks. I am watching the Michigan St (2 seed) vs Middle Tennessee (15). There were times when Midd Tennessee were up 10 on one of the tournament favorites, but currently it is a one possession game. I am rooting for team chaos (Midd Tennessee). I would much rather have a huge upset than have my bracket be correct, especially since everyone bracket in the pool has them going to at least the elite eight, with one having [Michigan State] as their champion. This would hurt me a bit, but with how my record is so far today, my bracket can take it, everyone else’s in the pool is also taking it. I just watch Middle Tennessee pull off the massive upset! That means I am down to a possible 6 elite eight teams, and 3 final four teams. This upset is much better than having a good bracket, as it was already pretty bad after yesterday. Upsets are the most exciting part of March Madness, and this is a huge one. I am watching Temple Vs Iowa right now. I put Temple, but 12 brackets in the pool have Iowa. Temple is currently down 2 possessions with a little more than 2 minutes left, so this would be great if they came back, would give me a big leg up over most of the bracket pool. Temple vs Iowa is currently in overtime! This is because Iowa missed a lot of free throws at the end of the game, and Temple got fouled taking a 3 point shot down 3 with 1.5 seconds left, and making those 3 free throws to send the game to OT. I just watch two of the most insane endings, back to back. Texas lost to Northern Iowa on a half court buzzer beater, and St Joe’s beat Providence because Providence held the ball for .1 second too long to send the game to OT on a dunk. Always lay up the ball if you are trying to beat the clock. He first touched the ball with about a second left, and as he went up for the dunk, I thought to myself there was no way he would get that off. It was actually a lot closer than I originally thought it would be. It was called a made basket, and replays were very close. I was rooting for overtime, for both my bracket and because OT ups the ante, but it was not to be. Through the second day of March Madness, my bracket is sitting tied for 9/16 in my group, 51.7 percentile of all ESPN brackets. I have 210 points, which means I got 21 games out of 32 the past 2 days. I got 11 right yesterday, and only 10 correct today. 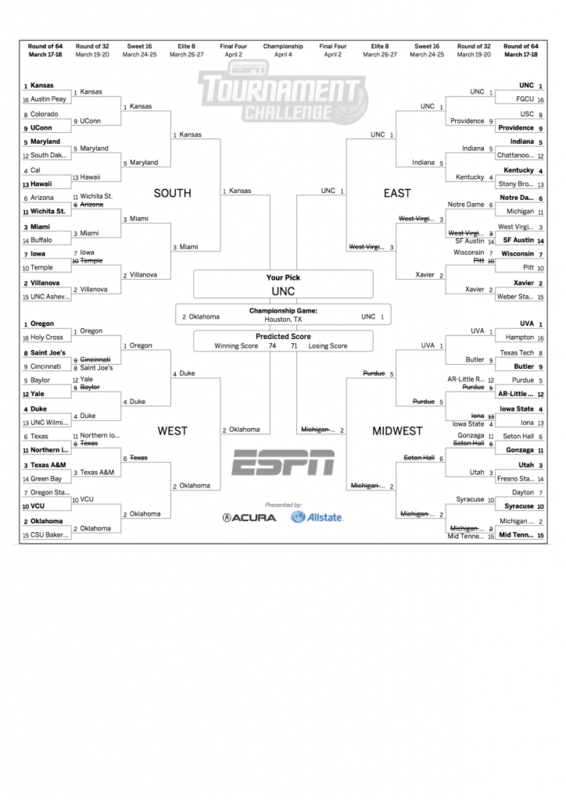 I also am down 1 final four team, and 3 elite eight teams, all from the right side of the bracket. This is terrible picking on my part. I did pick Hawaii to win, before I knew Cal would be out 2 of their best players. I was very excited to start the day off, with 4 straight correct picks, with some upsets, but Michigan State started off the rest of the terrible day. Texas and Providence lost to close the round of 64. I can only hope it goes better this weekend in the round of 32. The south bracket is still looking very good for me, but I am on team chaos side, upsets everywhere! This is my bracket at the end of the round of 64, the first round of March Madness! Check back tomorrow and Sunday for more bracket and game review and analysis!